Sodus Bay NY is the largest harbor on the U.S side of Lake Ontario. Although previously an important commercial shipping point, Sodus Bay has long been a vacation and holiday destination. 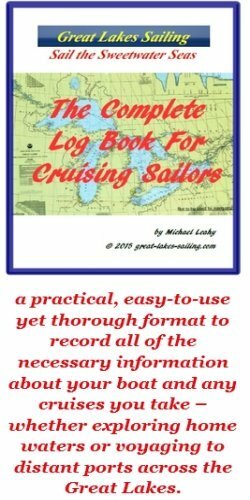 It is an excellent place to hole up during bad weather and its many marinas ensure that a cruising sailor will be able to find most things that he/she will need. The approaches to Sodus Bay are clear from all directions. Entry is through a channel flanked by concrete seawalls that extend out into the lake approximately 1/4 nm. The pier ends are marked by a lighthouse with a ISO WHITE light visible 8.7 nm on the west pier and a Fl GREEN on the east pier. The channel is aligned on a course of 182oT. Once clear of the channel markers, a course change to 140oT for .5 nm will take you into the bay. Once you have cleared the entrance channel, you have several options. Immediately to starboard is a cove formed by Sodus Point on the north and Sand Point on the south. At the end of this cove is Krenzer Marina. If you choose to enter the cove, pass the marker buoy R"4" with its Fl RED light and then make your turn to starboard. If you choose to pass the cove by and round Sand Point, you will find 5 large facilities for sailors on the west side of Sodus Bay. These are the main marinas in Sodus Bay. On the east side of Sodus Bay are three islands - Newark, Eagle and Leroy. There are anchorages near these islands and 4 marinas on the east side of the bay. Krenzer Marine facility of the north side of Sand Point is primarily a fuel dock (diesel and gasoline) and service area. Engine repairs, mechanical maintenance, hull and fiberglass work can all be carried out here. They have a much larger facility with more services and amenities on the south side of Sand Point (see below). This century-old yacht club welcomes sailors from reciprocal yacht clubs. With no dedicated transient slips, visiting sailors are directed to empty members' slips or tied (or rafted) along its seawall. There is no fuel dock. There is a pump-out station. There is water and power at each slip. There are restrooms and showers in the clubhouse. The clubhouse has a dining room and a bar. Internet access is available. There are also picnic and BBQ areas. Krenzer's facility on the south side of Sand Point is actually just across the road from its fuel dock and service area which lie on the north side of the point. Here you will find a full-service marina with 100 slips. About 1/2 dozen are set aside for transient sailors. As noted above, their fuel dock and service area is located on the north side of the point. There are restrooms and showers. They have a chandlery. The grounds have picnic areas and BBQ grills. This is a large, full-service marina - in fact one of the largest marinas on the U.S. side of Lake Ontario. There is a fuel dock (diesel and gasoline) and a pump-out station. They can carry of engine repairs, mechanical and electrical maintenance and fiberglass work. There is a sail loft located on premise as well. Water and power is available at dockside. There are restrooms, showers and laundry facilities. A large chandlery carries charts, a full range of maintenance and cleaning supplies and safety equipment. Other amenities include an indoor lounge, picnic and BBQ facilities and a games room. Sodus Marina has 200 slips with approximately a dozen for transient sailors. There is no fuel dock. There is a pump-out station. A full range of repair and mechanical maintenance services are available. There is water and power at dockside. There is a new clubhouse with restrooms, showers and laundry facilities. Othe amenities include a lounge, jacuzzi, fitness room, swimming pool and tennis courts. Internet service is available. There are picnic areas and BBQ grills and a lovely deck overlooking the bay. Primarily a powerboat marina, Arney's has 10 of its 100 slips set aside for transients. Check the depths though. There is fuel dock (gasoline only) and pump-out station. Engine repairs and maintence is available. There is water and power dockside. There are restrooms and showers as well as a well-stocked chandlery. Located on the east side of Sodus Bay, Skippers Landing has a 250ft / 77m pier with finger docks available for up to 20 transient sailors. There is no fuel dock or pump-out station. There is water and power available. Restrooms are available when the restaurant is open. Connelly's is on the east side of the bay. It has transient docking for up to 2 dozen boats. Water gets skinny after mid-summer so a call ahead would be in order before heading in. Water and power are available and washrooms when the restaurant is open. Fowlers marina is located on the southern tip of Leroy Island. It has 100 slips with 10 available for transients. There is a fuel dock (gasoline only) and a pump-out station. Repair services are available for gasoline engines as well as for fiberglass and canvas. There is a crane for haulout. There is a chandlery carrying engine parts and an assortment of hardware and cleaning supplies. Island Cove Marina is located on the mainland of the bay, on the east side of Leroy Island. It is a new marina with aproximately 50 slips, a dozen set aside for transient sailors. There is a fuel dock (gasoline only). There is water and power dockside. There are restrooms available. There are picnic areas and BBQ grills. Internet service is available. There is a small ship's store that caters mostly to firshermen and powerboaters. Oak Park is a resort marina. They have 250 slips with 50 set aside for transients. There is a fuel dock (diesel and gasoline) and a pump-out station. They can provide engine repairs (gas engines) as well as fiberglass rigging and prop repairs. There is a travel lift. There is water and power available dockside. There are restrooms, showers and laundry facilities. Other amenities include a swimming pool, a hot tub, game areas, picnic areas and BBQ grills. There is a small ship's store and a highly regarded restaurant. There is internet service available. On the east side of the bay, anchorages are available in a number of places. You can anchor on the north side of Eagle Island and Newark Island. You can also anchor off Connelly's Cove. On the west side of the bay, there is an anchorage ground on the south side of Sand Point, just east of Sodus Bay Yacht Club. Art Ertel's Marine and Auto Service offers full repair services for gasoline enginesas well as fiberglass, electrical and prop repairs and maintenance. It is located a short walk from the marinas in Sodus Point. Bill Kallusch Boats is a dryland facility located adjacent to Arney's Marina. It specializes in building and maintaining wooden boats. Engine, fiberglass and prop repair services are available. Fowlers Marina has repair and maintenance services (see above). Great Lakes Marine Works is adjacent to Sodus Bay Marina. They have repair facilities for diesel and gasoline engines as well as a full range of hull maintenance services for fiberglass, wooden and steel-hulled vessels. It has a travel lift. Katlynn Marine has repair and maintenance facilities (see above). Krenzer Marine has repair and maintenance facilities (see above). Oak Park Marina has repair and maintenance facilities (see above). The Prop Shop specializes in propeller repairs and work at all marinas in the bay. Sodus Point village has a number of small shops that can supply provisioning essentials. Rochester General Hospital (315-483-3205) has an acute care facility in Sodus, NY, about 5 mi/8 km south of Sodus Point. There is a CSV Pharmacy (315-483-2502) located in Sodus, NY. There is quite a variety of choices around Sodus Bay. Connelly's Cove Restaurant is well-known for their Sunday BBQ's accompanied by entertainment in the afternoons and evening. There is complimentary docking for diners and an outdoor patio. Skipper's Landing is a steak and seafood house with complimentary docking for diners and an outdoor patio. Captain Jacks Good Time Tavern is located in the village. This tavern offers casual dining both indoors and on an outdoor patio. Its second floor deck overlooks the water. The Bay Street Restaurant is located in the 200 year old Bay Hotel. Despite appearances to the contrary, this is a restaurant with an excellent reputation for food and wine. It has an extensive wine cellar. This highly-regarded restaurant should be on your consideration list. Sodus Bay Yacht Club dining room is a causal dining spot for members and guests alike. It is open Thurs through Sunday. Oak Park Marina Resort has a well-regarded restaurant with steaks and seafood heading up the menu. They have a full breakfast buffet on Sundays that is very popular. Complimentary docking is available to diners. Sodus Bay is a place to relax. There is a restored (though non-operational) lighthouse in the village with an interesting museum. Every Sunday, there are concerts on the grounds. There is an excellent beach on the north side of Sodus Point with a childrens play area. A quick look at this Sodus Bay tourism site will give you many ideas on getting the most of your visit.